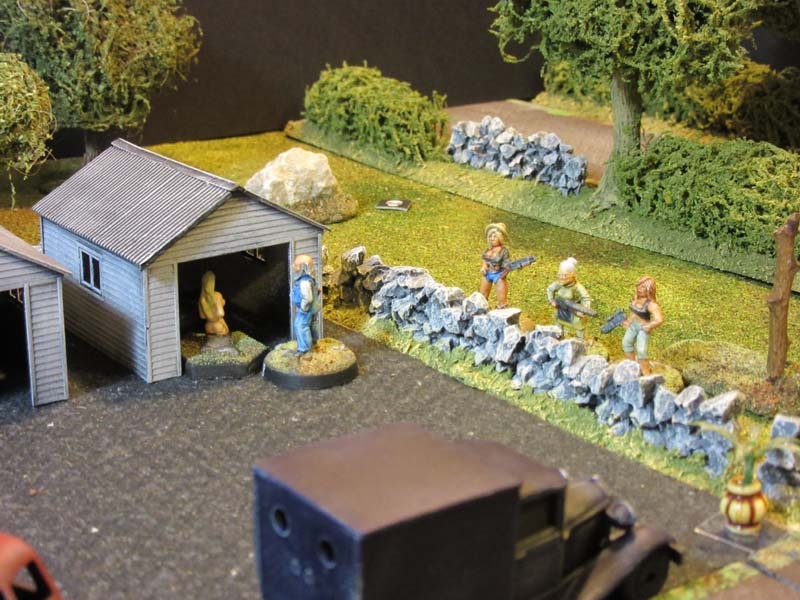 Following the run in with the Revenue Men, rumours started circulating that Pops and Granny have money stashed away and their granddaughter Daisy May has been captured by a gang of savages, cut throats and vagabonds and she is being held captive at a remote house. They have demanded a ransom but Pops and Granny, together with their other 2 other granddaughters, Betsy May and Ellie May, got wind of the location of the house and determine to rescue Daisy May. The story going round is that the kidnappers sent the ransom demand on headed note paper but I’m not sure I believe that. The rescue attempt is a big risk for them, they don’t know how many savages there are, at least 6 but probably more, however no one messes with Pops and Granny and gets away with it. The isolated house with the gangs transport parked up in the yard. Granny’s plan, yes she is the boss, was for her and Ellie May to move down the road on the right and circle round to the house from the far side. Pops and Betsie May meanwhile would go towards the wooden crates so that then they could rush the house from two sides at once and hope surprise would give them enough of an edge. Betsie May was instructed to keep that damned old fool out of trouble. Pops was going a little deaf, a little short sighted and didn’t have 2 brain cells to rub together, but combined with the fact that he was as brave as a lion – well it always led to tricky situations. You can see that none of the characters are super good, they all have their strengths and weaknesses, originally I used an average dice to determine the stats. The elder generation must have trained in some form of martial art in their younger days as the oldsters are exceptionally good at fighting. Maybe it was kung hillbilly fu, one of the lesser known martial arts developed by Jed “Bruce” Clampett-Lee. Another view, all looks quiet. Too quiet! Ace = Savages 1D6 -3. 2 = Savages 1D6 -2. 4 = Savages 1D6 +2. 6, 7 & 8 = nothing there, stop being so jumpy. 9 = Trip wire test on awareness to discover it, if not then it make a noise, test on savages awareness to see if they hear it. 10 = Daisy May + Savages 1D6-3. Queen = Information as to where Daisy May is. King = Daisy May + Savages 1D6 +3. Pops and Betsie May encounter 7 of the savages but they see them before being discovered themselves. The little white head followed by a cowboy hat seen just over the hedge far right are Granny and Ellie May carrying out their pincer movement. This is Ellie May bringing up the rear. Nice rear and interesting comparison shot. I love the Granny and Pops figures, but can’t remember who makes them. 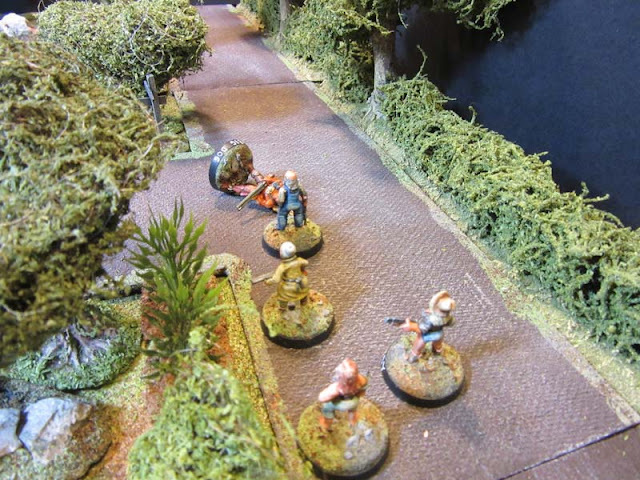 Pops decides, or maybe with Brains of 2 Pops didn’t decide anything but anyway it seemed like a better bet to go and join Granny and try and get around the savages blocking their path. They joined up with each other quite quickly due to a bit of slow movement on the part of Granny, i.e. she did not activate for 2 turns, which was fortunate for them all. I never thought too much to her plan. Pops walks up to the next encounter which turns out to be 1 savage called Big Dog, - by name and nature. He is half as big again as Pops but the little man is not phased by this, how does it go “the bigger they are the harder they fall” That’s right - Brains 2 Guts 5 the little man is not going to back off. In the distance Big Dog facing off to Pops. 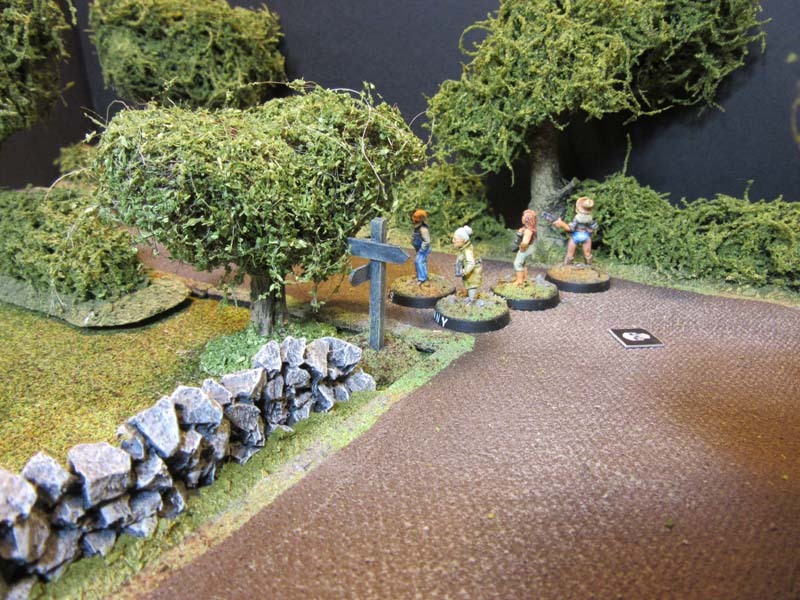 The encounter marker on the road is now in sight and is resolved as another group of savages - random direction dice decides they are heading towards the house, so don’t look back. The 1st group have been milling about but have also decided to head for the house. Big Dog is so surprised by this little old man that he does not shout out to his mates but smiles evilly and says what do you want you little baldy old man “WHOOP” Pops hits him with a double turning kick and Big Dog drops to the floor, “who you calling old” grunts Pops. Big Dog doesn’t reply, in fact he doesn't move either. Both the groups of savages head to the house, no one hears Big Dog fall like a large tree. The group on the left enter the house 1st and a turn later so do the other group. This is good and bad news. There is not going to be much opposition outside but the house has 5 encounter points in it because logically that is where Daisy May would be held. Pops and the girls continue up the track, as Granny passes Big Dog she bends down and cuts his throat, “don’t you call my man old” she whispers in his ear. To do a bad deed Granny had to roll over 3 on her Affinity target, she got a 6 so was able to do a very bad deed indeed. There is another encounter marker in the field between the Hill Billies and the house, so far it’s looking hopeless, they have counted 13 savages in the house, there are 5 encounter tokens also in the house, 1 round the back of it and 1 in the garage, not good odds on finding Daisy May without committing suicide. This is the encounter in the field, “bugger” mutters Pops “a dawg” I hate dawggys, this is a stupid dog, it doesn’t bark just charges up to kung fu Pop and gets chopped down, dead. I’m not sure why Ellie May always has her back turned to the camera, she must be showing her best side, or maybe it’s the new hot pants she wants to show to best advantage. The guys hop over the wall and rush forward to the garage. Where they encounter Daisy May with 1D6-3 savages, I threw a 3 so no savages. What a bit of luck. Pop quickly unties Daisy May and they both get back across the wall. It’s looking pretty good, all the savages are in the house. Pops and Granny have rescued Daisy May and there are no encounter tokens between them and getting the hell out of Dodge. What can stop them now. 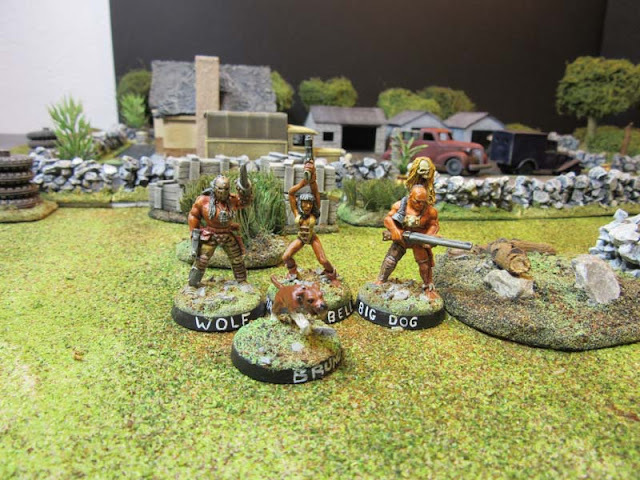 Just then Wolf and Mad Maybelle come out of the house for some fresh air, they see the Billies and open fire first, the wall provides good cover and the shots miss. Reaction for being under fire is good, even for a coward (intelligent person) like granny, she threw 1 and 2 so they all returned fire. 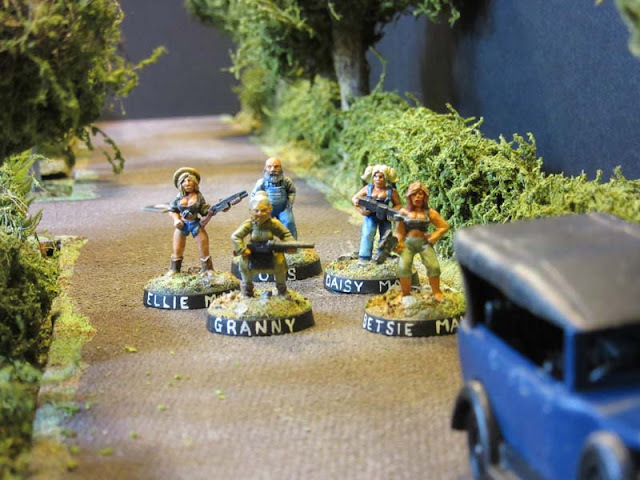 Betsie May fired her smg at Maybelle and missed all 3 shots, granny blew both barrels of her shot gun at wolf and missed him, hmmm not looking so good. Ellie May’s pump shotgun was next and a throw of 6 killed Maybelle – dead. Pops, also with a pump killed Wolf, “that’s for THINKING I was old” he was heard to mutter. 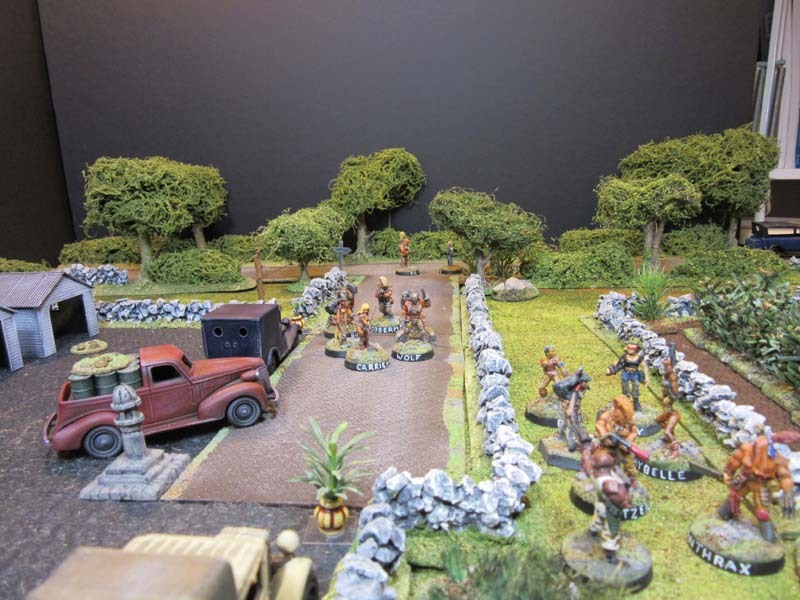 The savages were stunned (failed reaction) and did not dare leave the house, the Billies, all 5 of them are seen here running back to the getaway car. By the time the savages recovered their nerve and activated it was too late - the Billies were in the car and over the skyline. The victorious and slightly out of breath Billies. I’m not so sure Ellie Mays rear is her best side after all. The in breath, and out of pocket savages. The mutt and the rest of the dead. 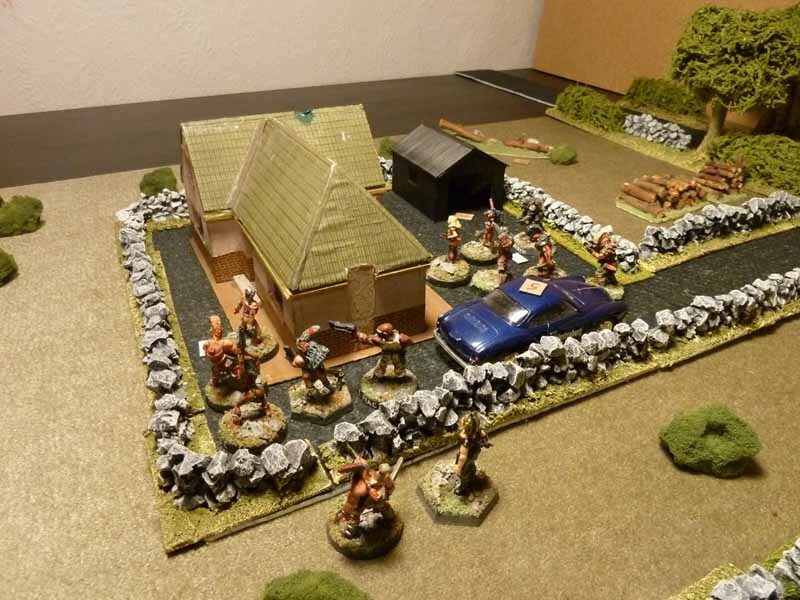 Quite an amazing result, the Hill Billies had some luck on the dice when both groups of savages went into the house with an even larger slice of luck when they discovered Daisy May, without guards, on the last encounter marker available without them having to go into the house. There is very little chance they would have survived that, and Pops with no brains (2) and lots of guts (5) would almost certainly have led them in there. I know I said Granny was the boss but Pops is the man about the house and wears the overalls. Typing this up now I realise that the odds were stacked too heavily against Pops and crew which is probably why it was such a memorable game, even though the body count was low and they succeeded easily it could have been disaster. I played this game quite a while ago and re-photographed it for the post, I thought I might show the original game photos so that anyone who has not spent 5 years refining terrain (yes I know it still needs work) can see that in my opinion it's the game that matters not the terrain. I enjoyed this game as with all the Granny and Pops games and have cleaned them up to post here, but the essence of the game was played with some quite nondescript terrain and is in my opinion the enjoyable part of wargaming. 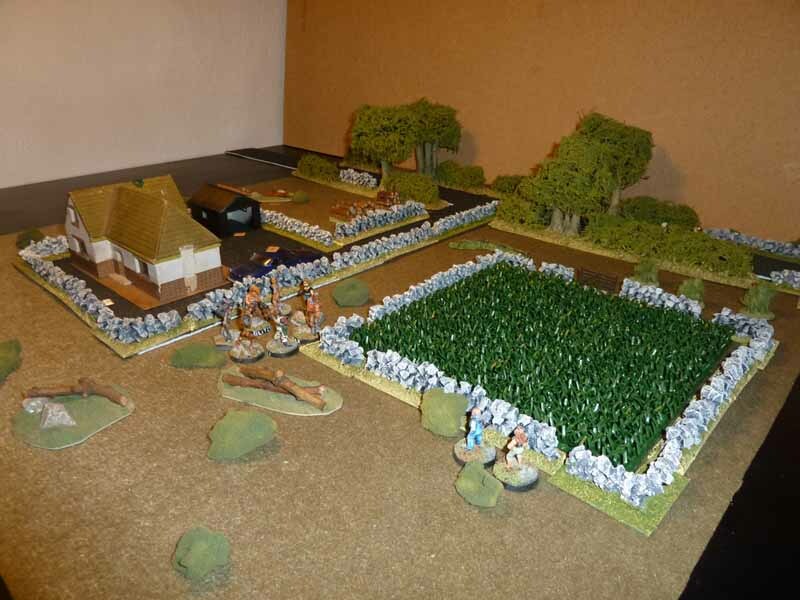 The original game, a cloth mat instead of a caulk mat, the original house I bought for £1:00 and a door mat for crops. The original game shot, it looks very basic in comparison but the game and the text are original, don't ever be mislead into thinking terrain is more important than having an exciting game, it isn't. It's nice to see but only for other people. If you are still here – Thanks for reading and any comments or thoughts are warmly received. My goodness, the gods of good fortune were certainly shining down on the Hill Billies in this encounter. Just about everything that could go right for them did. Terrific stuff, John! As you say that could well have turned out a whole lot different. The new scenery is simply stunning and I am very glad you took the time and effort to reshoot the game. 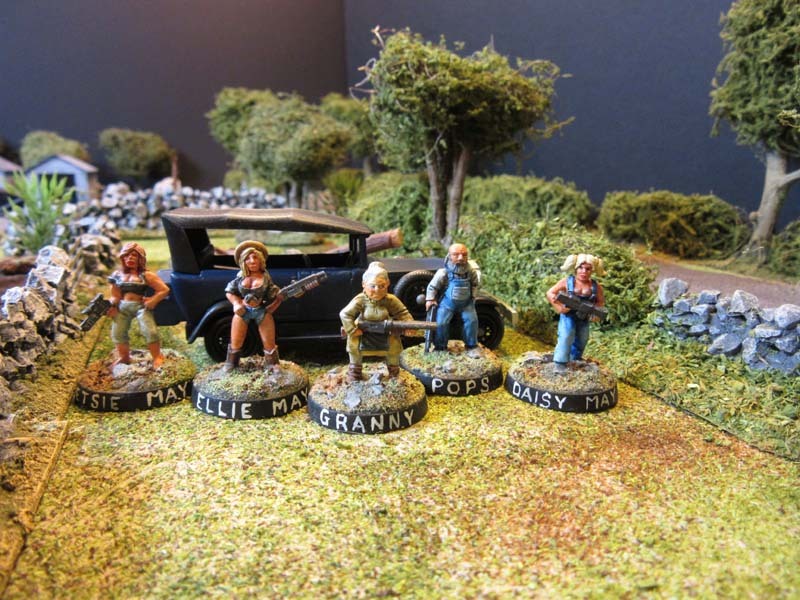 Whilst I recognise all of the figures you used for the savages (I have them all myself) I couldn't recognise any of the Hill Billies. 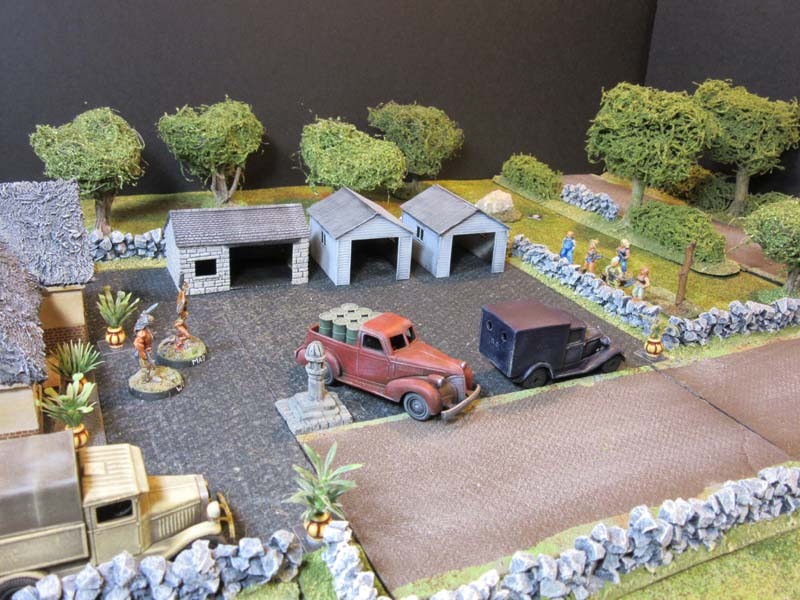 Cheers Bryan, Thanks for the thumbs up on the re-vamped scenery, I think the only point is the game can be just as exciting with rubbish scenery as with good but it just looks visually more attractive. I guess that's why we use figures and terrain rather than cardboard counters. I wondered if the Granny and Pops and maybe the girls as well were from a company called Amazon, I know I have some of their figures. A very interesting point you bring up at the end there about terrain & while I agree in part with you I'll try to explain my view on it. If we take wargaming as a whole its made up of four parts, the game you play, be it a THW 40K or whatever even a bit of a few different games, the people you play with (if not playing solo) the models & the gaming terrain. The most important are the first two (unless it solo) as a bad game will be a bad game no matter how well the models look or the terrain looks, a good game can be ruined if you playing a bad gamer, a bad gamer can come in in lots of different forms, but games imho work best when played be like minded players, so competitive V competitive fun V fun that kind of thing. 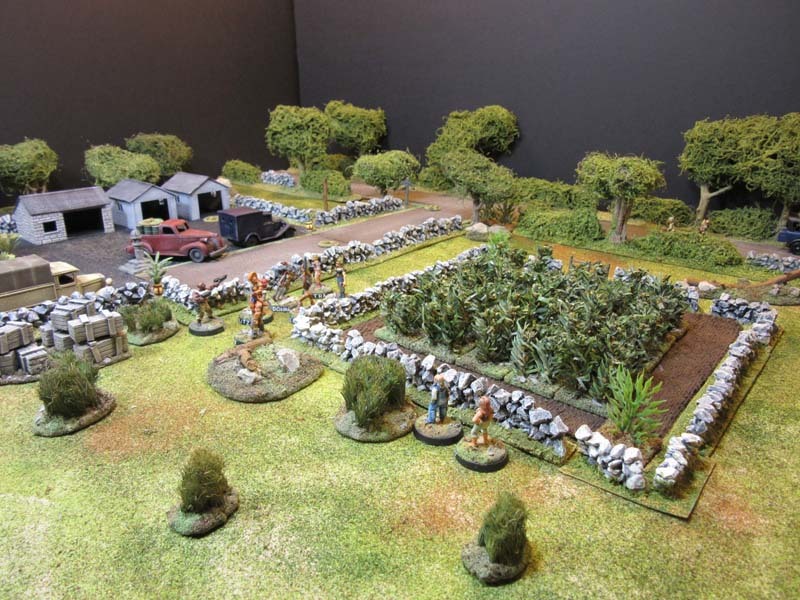 The models painting level or the terrain won't make a good game bad or a bad game good, but they will enhance the over all experience of a game. A thought provoking reply Frank and I agree with all of it. I've never played anyone who has a half painted army although I went to York show this year and a few of the competition games had half painted armies on the table, but I thin competitive gamers get a different kick out of the hobby to the one I get. Having said that I am going through my old wargaming magazines to try and get shut of more stuff and came across a 1983 Battle for Wargamers - Wargames Manual it has a two page article about competition wargames and on page 25 the winners of the 1982 FIASCO team competition is my old wargames club and I was one of the 3 team members. It does say about the competition is that it was the most friendly one on the club circuit at the time. We had just gone up for a bit of a laugh and to play against some different opponents and were most surprised to win. Great report! Yep, lots of luck for the Billies, but could easily have gone much worse. 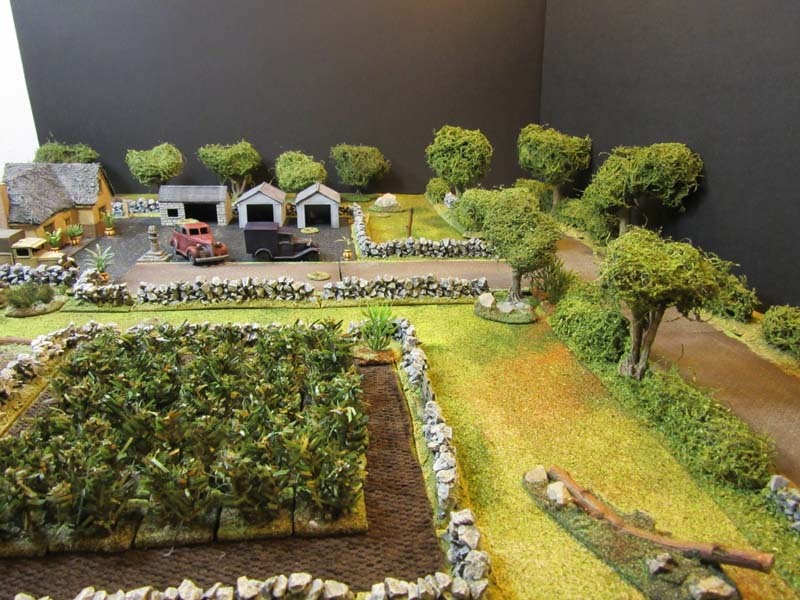 I like that you posted some of the old pics to illustrate your point about terrain. Of course, no one is advocating unpainted figures or boxes for terrain. Although I don't see anything wrong with going that route for trying stuff out before you have minis painted and terrain built. 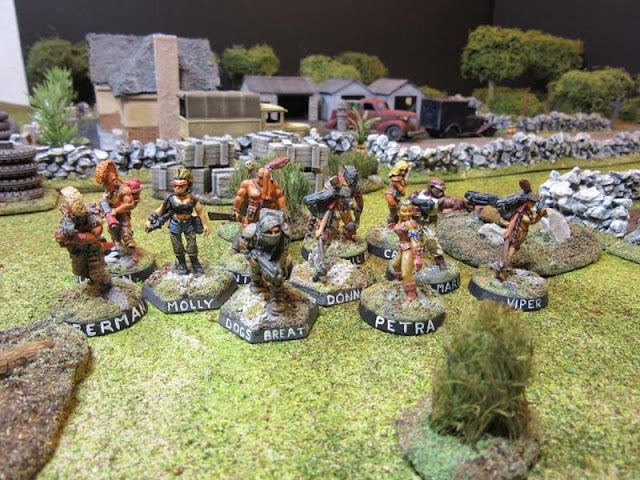 At the same time it's easy to get bogged down in painting and prepping and building terrain and all and never get around to playing games. I know, I have been in that mode for a while now. Although, I do enjoy the painting and terrain building, too, so I'm still having fun. Hi Fitz, I know no one is advocating unpainted models or boxes mate & least of all John :) its always so hard to explain things :( I was using them to try & make a point as there are many people in this hobby that to them the game is all that counts & have no interest in the other stuff, there are some that only ever paint & never play. Hi Fitz I think maybe the difference is we all try and post our good stuff not the rubbish, and when people look at it they see it as it is, not where it's come from. I don't know who might be reading my blog but not commenting and if there are any guys with a limited amount of terrain and figures reading I wanted to try and show my best but also where that's come from and what I think is important as well. We all need attainable goals and once we've attained them we set new ones. 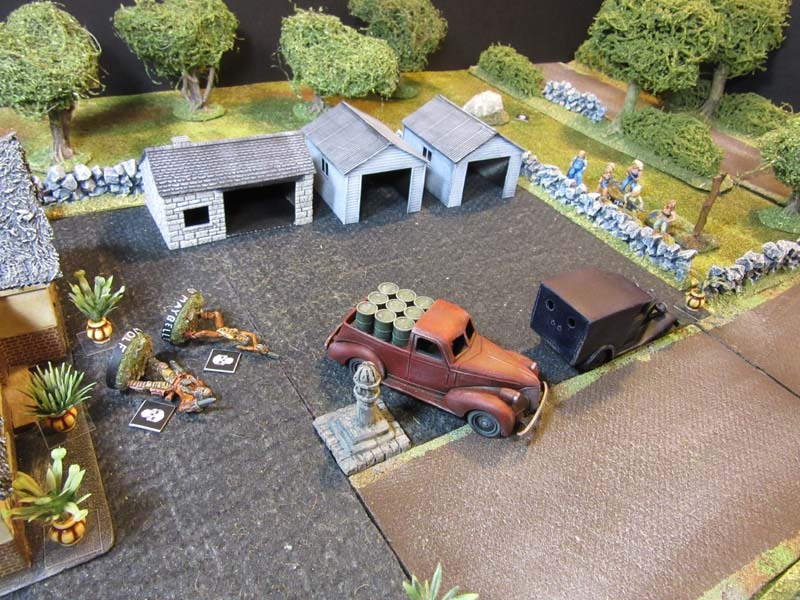 I started with unpainted Airfix figures on a sand table in the shed when I was a kid and if there are any kids reading this, that's probably where everyone starts. Humm I hadn't intended getting philosophical. This is intended to be about madcap adventures with toy figures and having a bit of a laugh. True, Frank. 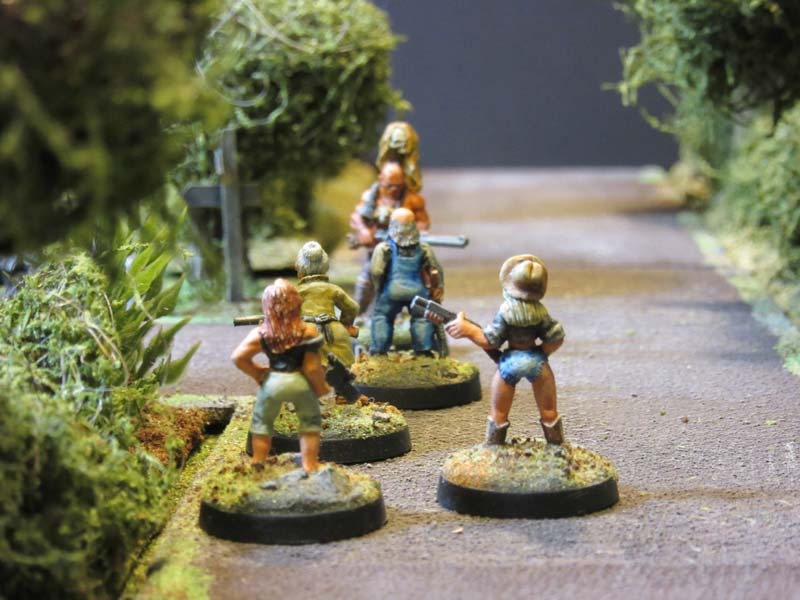 Most of my gaming is solo so I haven't run into many miniatures gamers in analog space. 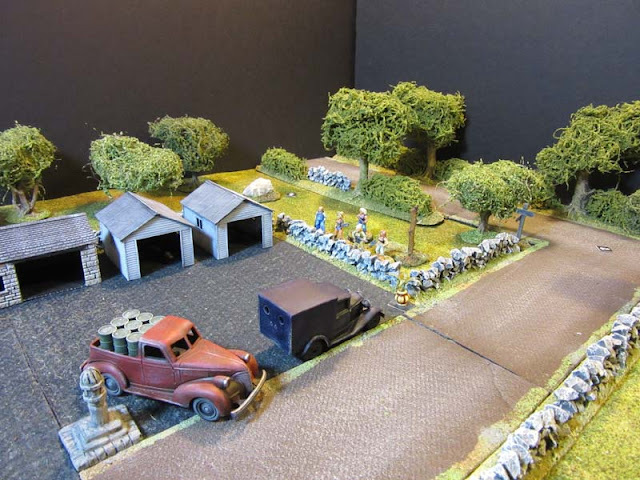 I also started out as a kid with unpainted airfix figures half a century ago or more. By high school I was into painting minis. The main point here is this "enjoying your hobby" and "having a bit of a laugh". 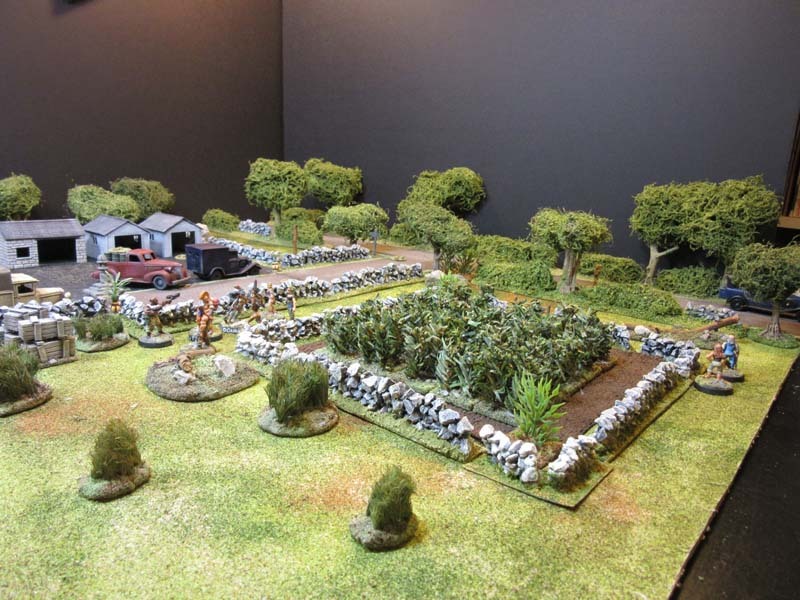 All the fancy tables, terrain, minis, etc., we see proudly displayed (rightly so) can put pressure on us and make it easy to lose sight of the "fun". 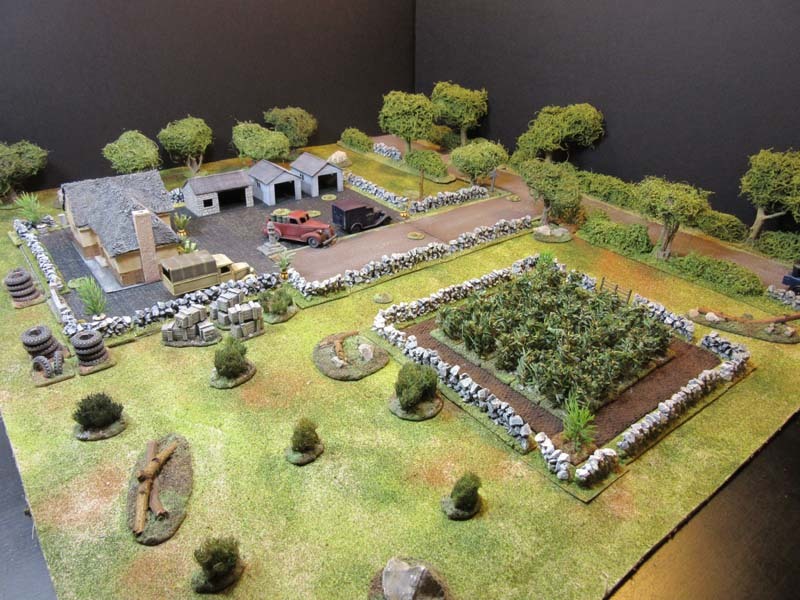 Sure, good terrain, painted minis, etc., look good and can help with "immersion" and suspension of disbelief, but as was said, we all have to start somewhere. 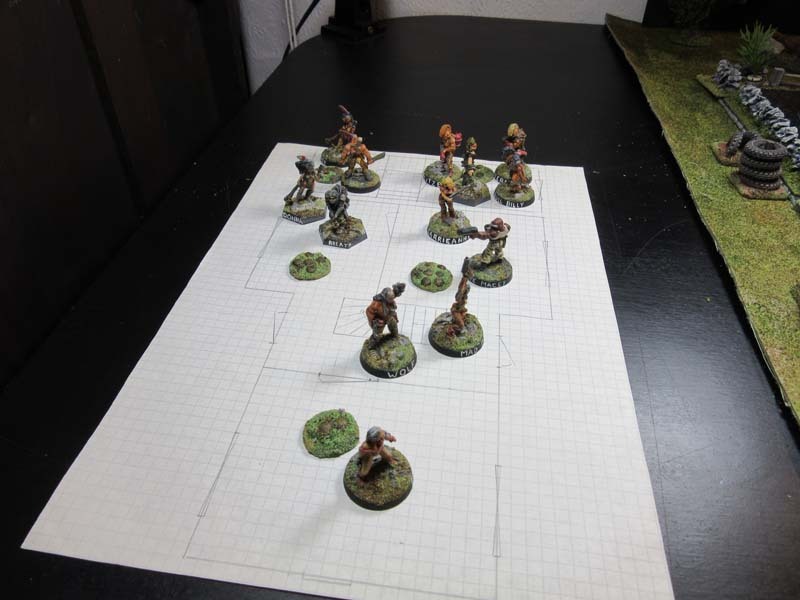 Maybe the trick is to find a good balance of painted minis, terrain, and such that will get one to the game table to play sooner rather than later. 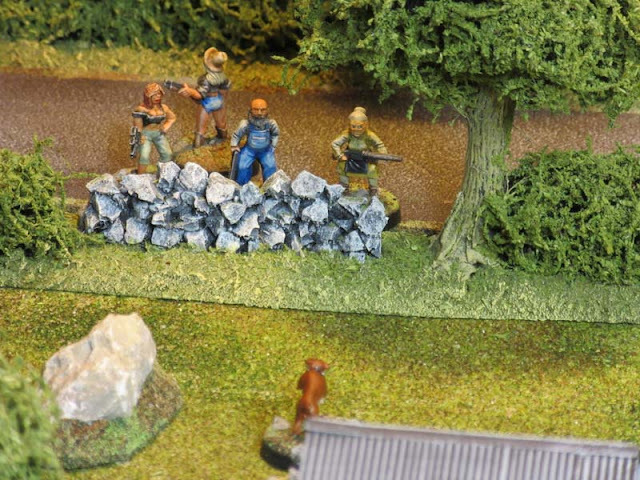 One way is to figure out a few figures to get started with, for example, and some key pieces of terrain. Things that can do double duty (or more), such as versatile buildings with modular parts, commercial terrain pieces, even pre-painted minis, can help, too. Great report and U certainly wondered why you'd stacked the odds against Gran and pops, but as it all turned out well, who cares? As for your early terrain, I've seen a lot worse that was proudly displayed. Terrain, to me, isn;t that important, I wish to play the game ! However if I'm willing yo show it to others (and not my like-minded friends in the good 'ol days), then it needs to be half decent as it canbe improved over time 0 as your before and after pics show. 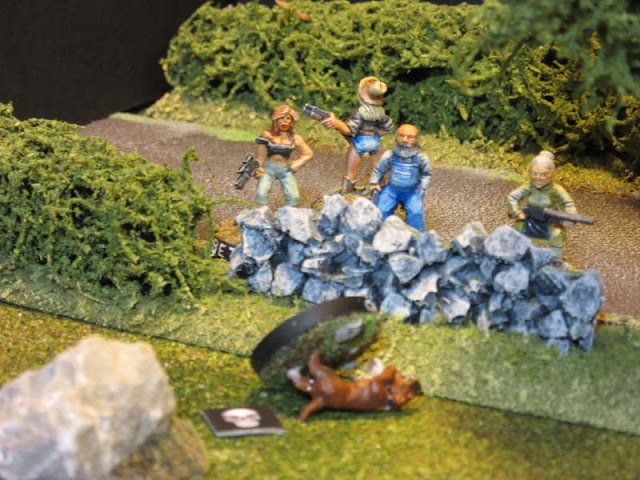 Howvever I can;t recollect ever playinf a game with un-painted figures in well over forty years of gaming though I have seen it done (especially in theth current plastic age of figures). Hi Joe I guess at the time I didn't think it was loaded against them, only in retrospect. As I'm soloing these games it doesn't matter too much who wins or has a chance of winning, life after all is not fair or evenhanded. Re quality of terrain, I'm just repainting a building for the third time, the last time it was an improvement on the first time and I'm hoping this one will be an improvement on the second time. All I can say is that each time I was pleased with it then but it's not good enough now. What would be nice would be if I could get it right the first time ;). Wonderful minis and table. I really like those EM-4 guys and how you painted them. Another brilliant story and game John, despite being in the vault for some time :) You gave me a chuckle at the comment of Ellie May always having her back to the camera! Ivor if I made you smile then I'm happy. Wargaming is different things to different people, many of the most memorable games to me are story driven, that's just my opinion. 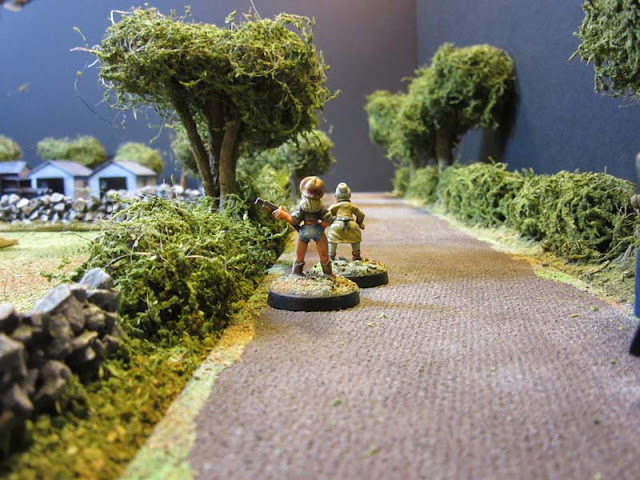 Indeed 2 of them that stick out in my memory most are ones that didn't have brilliantly painted figures or terrain but they were gripping stories and the two guys that played/wrote them had both used the game to create that story line. 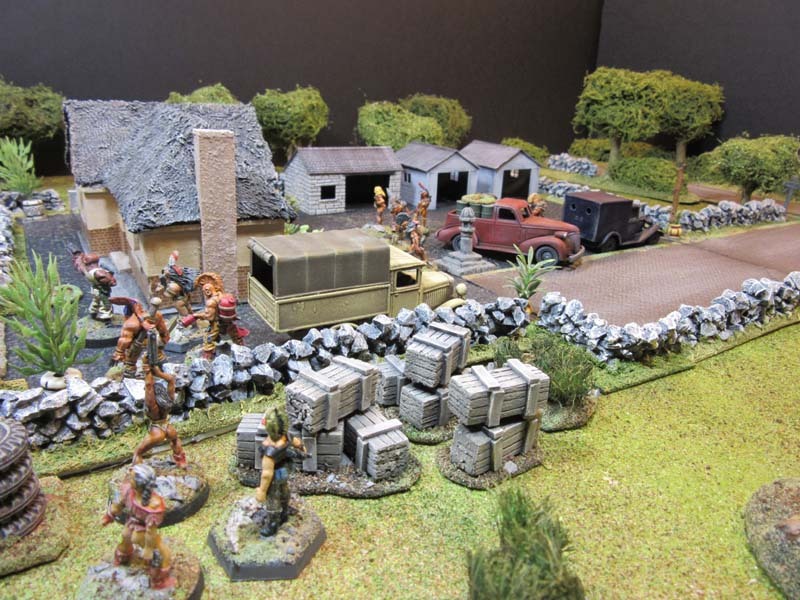 Of course my interest is just a small corner of what falls under the umbrella that is wargames. Thanks for the rest of your nice comments, I do appreciate them even if maybe not deserve them. Cracking report. Love your collection of miniatures and terrain it is truly a beauty to behold. Cheers mate thanks a lot. It's nice when your little tin-men have a break. I really like the comparison shots. Fun to see the changes. Granny and Pops go to Town in Zomtober!